Many have come and gone, but ‘Mystere,’ the original must-see, remains at T.I. As the artistic director at MYSTERE, I’m often asked: What is it about MYSTERE that people love so much, what keeps them coming back — what is the secret? The answer is simple. 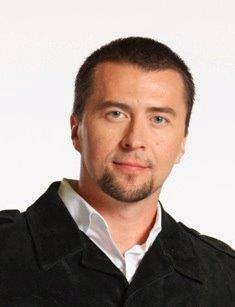 Tim Smith is the artistic director of Cirque du Soleil’s “Mystere” at Treasure Island. But Robin wanted to turn the spotlight on somebody in the show who is perhaps even wilder and more unpredictable: Meet Paul Lopez, who while overweight still shocks stripping down to his G-string after defying death on the high wire. We also have Tim Smith, the artistic director from Cirque du Soleil’s first Las Vegas show, MYSTERE, still going strong after 23 years. Here’s Tim with the secret to the show that’s entertained more than 14 million guests in more than 10,000 shows. The beloved and enchantingly beautiful MYSTERE by Cirque du Soleil is a 23-year-old hit on the Strip at Treasure Island, its original home. While many theatrical productions have come and gone, MYSTERE, the original must-see, remains a constant, entertaining millions who attend from Las Vegas and across the globe. 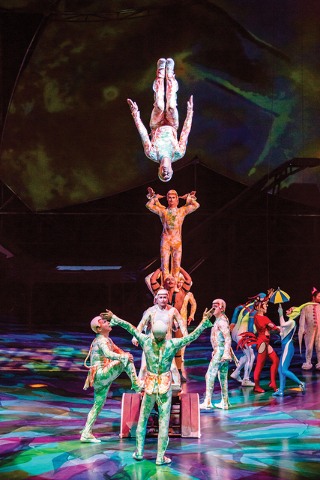 To date, MYSTERE has entertained more than 14 million guests in 10,000-plus shows. As the artistic director at MYSTERE, I’m often asked: What is it about MYSTERE that people love so much, what keeps them coming back — what is the secret? The answer is simple. There is no secret formula but rather an emotional connection, one between a brand and its audience that’s pure, thought-provoking and, in our world, uniquely entertaining. Part of that emotional connection with our audiences is the ability for us to entertain them in ways they’ve never experienced before by constantly upgrading our shows with newer, challenging acts that shock and inspire. These frequent updates are what keep MYSTERE exciting and fresh, differentiating us from a typical Broadway-style production where audiences will see the same show night after night. If you saw MYSTERE five years ago, when you return, you would experience it in a familiar, yet different way today. Since its beginning, MYSTERE has set the standard for which all Las Vegas productions are measured. 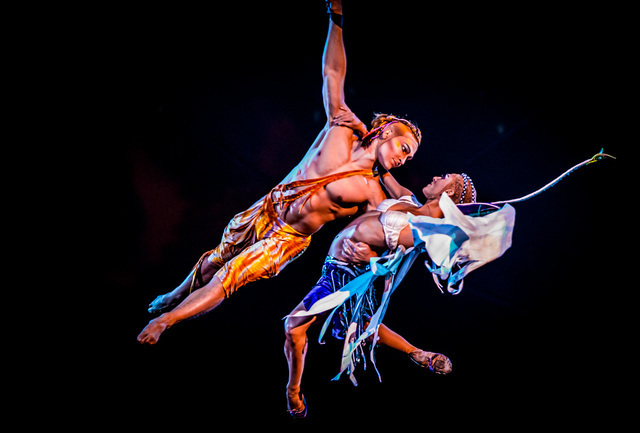 The show continues to incorporate “pure Cirque” elements including powerful athleticism, high-energy acrobatics and vibrant imagery and costuming, while also featuring subtle changes in choreography and staging that impact how the audience feels, interprets and connects with the show. These changes also re-energize and challenge our artists, allowing them to expand their skill sets and be engaged in the work they do. A great example of our ever-changing theatrical landscape is the new Teeterboard Act that arrived this summer, which is part of the Planche Act that features the trampoline, fast track and teeterboard disciplines in one exhilarating, captivating scene. No doubt one of the most awe-inspiring moments in MYSTERE, the Teeterboard Act hasn’t changed since its premiere in 1993, making this new rendition even more exciting. Fulfilling the Cirque mission to create, we wanted to elevate the act by adding a new teeterboard, more powerful acrobatic sequences, faster-paced choreography and new artists. The new board is shorter than the original and catapults artists higher and faster into the air. Where they could once fly 10 to 15 feet in the air, they are now soaring to impressive heights of nearly 20 feet. Additionally, MYSTERE is uniquely entertaining for all generations. Being unlike any other production has helped us build loyalty with audiences across the globe. Fans know that while there are seven Cirque productions on the Strip, MYSTERE has its own identity, story and rhythm. Thrilling action, colorful characters and vibrant imagery abound while a live band with vocalists score this mesmerizing journey through life. 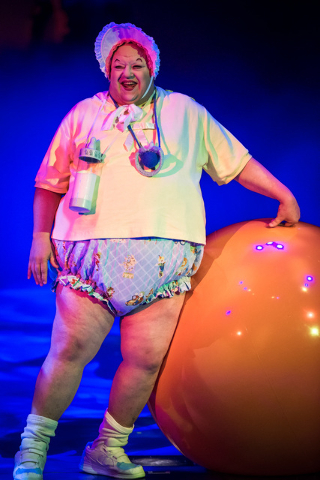 Regardless of your background or age, we know that when you hear the musings of a larger-than-life baby playing with the crowd, or catch a glimpse of the whimsical bungee artists soaring 50 feet above the stage, you will smile at the fantastical beauty, skill and finesse that define this amazing show. To further connect with our fans and say thank you to the community, we are going one step further and opening our doors during rehearsals. Now fans have the opportunity to see how our artists train and get a rare inside look at what goes into preparing for our shows. Open rehearsals are free and open to the public, so it’s a wonderful experience for everyone. During these rehearsals, we host Q+A sessions that allow guests to ask questions to gain a better understanding of our artists and process. If you’ve never experienced MYSTERE, or it’s been awhile since we’ve seen you, get to know us again and witness the magic of MYSTERE for yourself. It truly transcends time and continues to offer something special for our city — and you. The new Teeterboard Act at MYSTERE debuted July 2. To see artist training sessions and enjoy a special 2 for $99 ticket offer, visit open rehearsals at MYSTERE every Saturday from 3 to 3:30 p.m. and 4:30 to 5 p.m. Sundays. MYSTERE performs Saturdays through Wednesdays at 7 and 9:30 p.m. at Treasure Island. More: CirqueduSoleil.com/Mystere. Be sure to check out our other guest column today from the hilarious Paul Lopez, who portrays high-wire artist Fat Frank in ABSINTHE at Caesars Palace.